Show your brand! 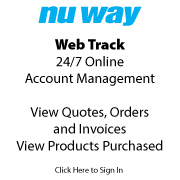 Nu Way offers custom imprinting on safety gear. Save on labor cost with Motorola radios. Free Radio, multi-unit charger or $150 Visa gift card with every 6 radios purchased. Double your free items when you buy 48 or more radios. See flyer or store for details. We have a selection of STIHL Outdoor Equipment that we are clearing out. There is limited stock available. Multiquip specials for Spring 2019 on compaction equipment, dewatering pumps, mixers and generators. 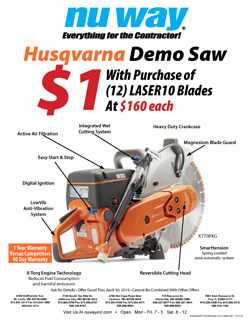 Buy 12 Husvarna Laser 10 Diamond Blades and get a K770 Power Cutter for $1. LogoLock for fiberglass ladders. Promote your company name. Deter theft by displaying your logo. Each ladder receives one custom logo applied to each side rail. Start the first quarter of 2019 off with these special offers from Milwaukee.